Conrad Anker and Jimmy Chin have been major names in the climbing world for a long time. Both of the athletes have built themselves into climbing superstars. Conrad is world famous for his ascents and even made waves in the non-climbing world by finding the body of George Mallory on Mt. Everest. Jimmy is well known for his climbing photography and cinematography. It didn't surprise me when I started to hear stories about Renan climbing with Conrad and Jimmy. There's no doubt that he had the chops to play in the same world class arena as the other two. There have been several articles and films that featured each one of these climbers over the last several years. But none of them come close to the aesthetic quality and the human tension that exists in the film, Meru. 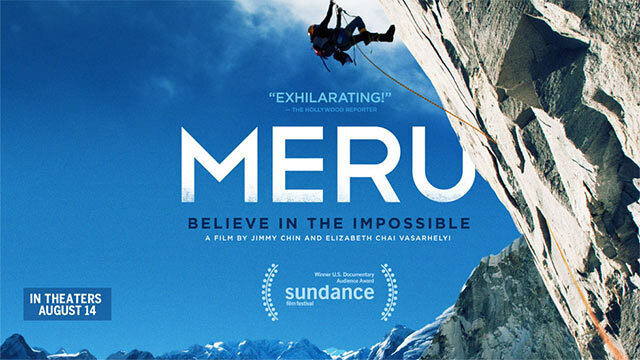 Meru tells the story of the three climbers and one mountain: Meru. Or to be more specific, the Shark's Fin of Meru, which is a massive granite peak that combines mountaineering, ice climbing, mixed climbing and A4 big wall climbing skills to ascend. Dozens of parties have tried the route, but no one had succeeded. Conrad attempted the route in 2003 with Doug Chabot and Bruce Miller, but failed. They simply didn't expect it to be as challenging as it was. The film chronicles his return to the mountain with Renan and Jimmy in 2008 and 2011. In the course of the film, we discover that all three of the men have dealt with close calls and loss. Conrad's mentor died first, and then his best friend. Renan becomes seriously injured in an avalanche. And Jimmy barely escapes from another avalanche with his life. 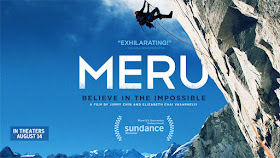 The three men all have different reasons for climbing Meru. It was a dream passed down to Conrad from Mugs Stump, his alpine mentor. It was a passion for Jimmy as he slowly brought himself back into the climbing and skiing world from his brush with death. And it was an absolute necessity for Renan to prove to himself that he still is who he was before his accident. I had an unusual experience in this film. It was the first documentary-style climbing film that I had ever seen with a non-climber audience. Most of the films that I see like this are at Reel Rock Film Festival, at Banff Film Festival or at 5 Point Film Festival. The people watching films at these types of festivals tend to be like-minded individuals, who don't hyperventilate at the heights depicted or question the motives of the climbers. "The people watching films at these types of festivals tend to be like-minded individuals, who don't hyperventilate at the heights depicted or question the motives of the climbers." I didn't hyperventilate but I did wonder if the fact that they make their living as mountaineers and filmmakers plays a major part in their decision to climb anything. Bigger, crazier, bolder, and more dangerous adventures is how many sponsored climbers, and filmmakers, get attention & funding. It didn't look like a whole lot of fun to climb Meru's Shark Fin nor did it look like a wise decision under the circumstances. I chuckled when Conrad said he climbed for the view - unlikely and unnecessary. I can appreciate the desire to follow a passion for adventure and challenges with friends, or alone, but there is a point when one should question the motives of climbers. Or, at least, the climbers might want to question their own motivation. Vanity, fame, and money seem to be the trending motivation for many. Give me a movie where the climbers don't expect to make a penny, don't receive glorious media attention, and don't put the lives of each other in jeopardy for a vanity project. Show me that climb of the Shark Fin. As for the film, it seemed like the critics were more likely to hyperventilate in their reviews than the non-climbing public. It was nice to see the film go beyond the climbing challenges and into the personal lives of these three but even that reminded me that these individuals all had close calls with death while working. It's their job. Thank you for your comment. An administrator will post your comment after he/she moderates it.